Illinois is known for its extreme seasonal temperatures. As summer approaches, you may be dreading the thought of cooling your business and keeping it consistently comfortable. 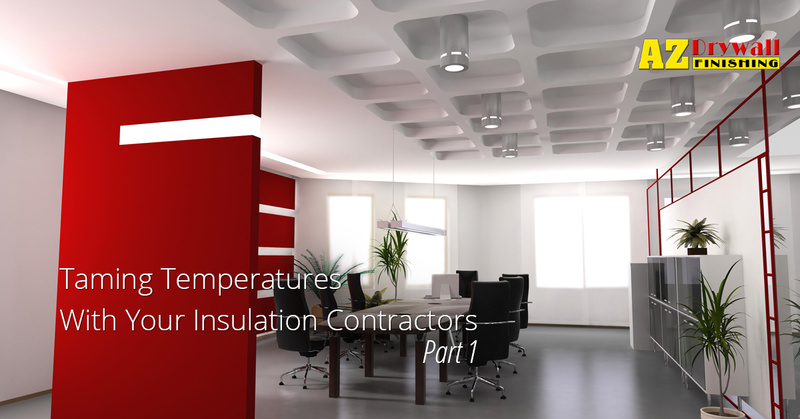 Building insulation is very useful for minimizing the negative effects that temperature can have on your company. Hiring professional insulation contractors for your Chicago enterprise may be a very beneficial move in the grand scheme of your operations. AZ Drywall Finishing has been providing customers with top-notch drywall and fiberglass insulation services since 1999. Insulation for walls and ceilings can provide a number of benefits, a few of which we will cover in this blog. When faced with so many positive improvements for your business, it should not be hard to call up one of the finest insulation companies in your area for help! The biggest and most obvious benefit of professionally installing building insulation is the ability to regulate interior temperatures regardless of outside conditions. Heat is transferred through three scientific processes, known as conduction, radiation, and convection. On hot days, the heat will transfer into your home via one of these routes and produce an uncomfortable interior temperature. Without insulation, heat will be much more likely to warm up the inside. The same principle applies when heat is trying to escape your home in the winter months. Air is in a constant struggle to reach a uniform temperature, creating the need for a blocking material. Installing insulation in your walls and ceiling will help to keep the good temperatures in, making everyone more comfortable while also saving money in energy costs. In the long run, our insulation contractors can help to completely offset the cost of your installation services. The insulatory effects of this material results in more consistency in terms of temperature control. For many facilities, this fact can be helpful for keeping sensitive equipment at an approved temperature. Unexpected swings in weather will not bring equipment surprises when you return after the weekend. Beyond the energy savings of fiberglass insulation, this consistency is also beneficial for your HVAC system. Heat retention and less variable shifts both work to keep your heating and cooling equipment running optimally. Without insulation, your furnace will need to work much harder to keep the building comfortable. The same can be said in the summertime when soaring temperatures are causing your AC to work overtime. Replacing a commercial HVAC unit can be more costly than those high energy bills, but both problems can be rectified with AZ Drywall Finishing! Everyone knows that insulation can help to keep the correct temperature inside while leaving high energy costs outside, but there’s more to this useful product than that. Next time, we’ll look at a few more benefits one can expect when ordering building insulation services for their business. AZ Drywall Finishing has extensive experience in a number of contractor services. We’re proud to provide quality insulation contractors to Chicago businesses and homes alike. If you are worried about the temperature retention of your building, we can help! Our quick and easy quote system will give you the information you need in no time. Feel free to contact us today with any questions!